When he announced, 'I will destroy Nigeria with truth', the feeble-minded who for decades have become subdued with suppression misunderstood the simple sentence coated with promise of healing and freedom. The wicked minded knew what was coming and for fear of the truth being exposed, they resort to lies, persecution and murder. Director, Nnamdi Kanu is a bona fide son of his father, he was breastfed with undilluted breast milk. 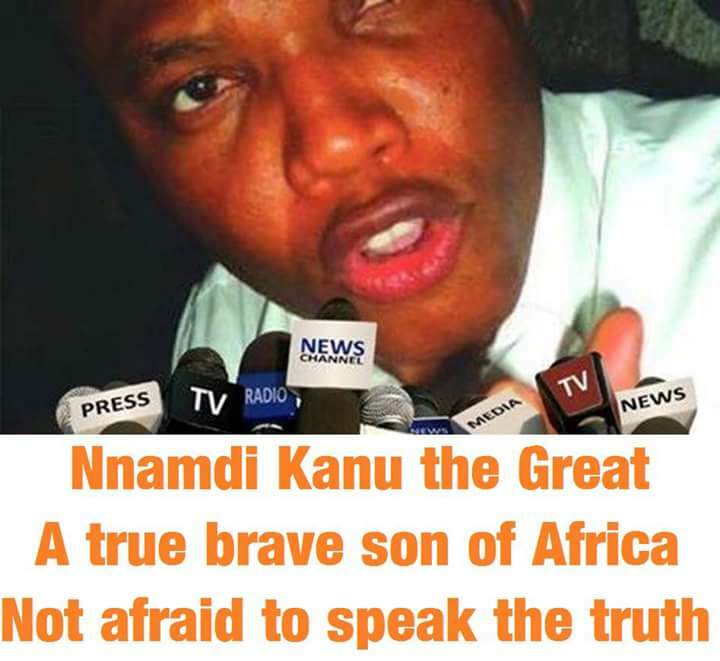 Through Radio Biafra, he has unseated the mafia cache sitting on the Nigerian falsehood and has opened eyes which for a long period have been scaled with blindness. There is nothing mutinous in exposing the truth and liberating a whole nation that has hitherto been erased from existence by crooked means. Biafra has been forced into submission by colonizing British. She had resisted continuously until 1914 when she fell to superior firearms. Britain used trickery and treachery to overpower the leaders in those days. Jaja of Opobo (full name: Jubo Jubogha; 1821–1891) was a merchant prince and the founder of Opobo city-state in an area that is now part of Nigeria. Born in Umuduruoha, Amaigbo in Igboland, he was sold at about the age of twelve as a slave in Bonny. Jubo Jubogha later took the name "Jaja" for his dealings with the British. Jaja proved his aptitude for business at an early age, earning his way out of slavery; he was enculturated according to Ijaw (Ibani) rituals and eventually established himself as head of the Anna Pepple House. Under Jaja's leadership, Anna Pepple soon absorbed a number of Bonny's other trade houses until an ongoing dispute with the Manilla Pepple House led by Oko Jumbo forced Jaja to break away as Opobo city-state in 1869. Opobo soon came to dominate the region's lucrative palm oil trade, and was soon home to fourteen of what were formerly Bonny's eighteen trade houses. Jaja also moved to block the access of British merchants to the interior, giving him an effective monopoly; at times, Opobo even shipped palm oil directly to Liverpool, independent of British middlemen. At the 1884 Berlin Conference, however, the other European powers designated Opobo as British territory, and the British soon moved to claim it. When Jaja refused to cease taxing British traders, Henry Hamilton Johnston, a British vice consul, invited Jaja to negotiations in 1887. When Jaja arrived, the British arrested him and tried him in Accra in the Gold Coast (now Ghana) then took him to London for some time, where he met Queen Victoria and was her guest in Buckingham Palace. After some other turbulent history, he was exiled to Saint Vincent in the West Indies. Plans were also made for him to be relocated to Barbados. In 1891, Jaja was granted permission to return to Opobo, but died en route, allegedly poisoned with a cup of tea. Following his exile and death, the power of the Opobo state rapidly declined. At the end of the 19th century, the Kingdom of Benin had managed to retain its independence and the Oba exercised a monopoly over trade which the British found irksome. The territory was coveted by an influential group of investors for its rich natural resources such as palm-oil, rubber and ivory. The kingdom was largely independent of British control, and pressure continued from figures such as Vice-Consul James Robert Phillips and Captain Gallwey (the British vice-Consul of Oil Rivers Protectorate) who were pushing for British annexation of the Benin Empire and the removal of the Oba. Ovonramwen Nogbaisi came to be the Oba of Benin in 1888. A British invasion force headed by Phillips set out to overthrow the Oba in 1896. The force's weapons were hidden in baggage, with troops disguised as bearers. Phillips plan was to gain access to Ovonramwen's palace by announcing that he intended to negotiate. Ovonramwen's messengers issued several warnings not to violate Benin territorial sovereignty, claiming he was unable to see Phillips due to ceremonial duties. Having been warned on several further occasions on the way, Phillips sent his stick to the Oba, a deliberate insult designed to provoke the conflict that would provide an excuse for British annexation.Phillip's expedition was ambushed and all but two were killed. Subsequently a military operation against Benin in 1897 led by Harry Rawson resulted in the burning of Benin City and the deaths of untold numbers of its inhabitants. Although the British had orders to hang the Oba, Ovonramwen escaped, but later surrendered. Ovonramwen was exiled to Calabar with his two wives, and died there in 1914. The foundation of Nigeria has always been based on lies and bloodshed, so it runs in the system from the colonial masters. They did everything to conquer and steal our resources including merging different entities just to achieve their means. This is sheer wickedness. The Nigerian tenancy is very unbecoming. When the British left, they should have hands off completely but NO! The oil wells in the eastern region made it hard for their greedy nature. To butress this, they systematically chose the uneducated gullible north to rule, arming them with military training which they are using wrongly. Unfortunately, Biafrans have always been on the receiving end, it seems they were instructed to keep Biafrans under subjugation. They have been butchered unceremoniously in the northern and Western branches of this illegal contraption. This is one of the reasons for the Aburi accord. The treachery in Gowon made him recede and not abide by the accord in Ghana but went back on his word upon his arrival in Nigeria. This led to the Civil war. Dim Odumegwu Ojukwu called home our people and declared our nation which has existed before Nigeria. Gowon, realizing what losses they were going to incur, moved in on Biafra and brought in the world deceptively by the help of Britain to fight the people of Biafra. Biafra warred as heroes for over three years. We made our bombs (Ogbunigwe), we made our petroleum products, we made our aircrafts, we produced non stop electricity for the duration of the war, we started what is called Ojukwu agricultural production when food became scarce. Our only weakness was that the world were with NIGERIA, raining destruction on us and our children. Forty five years after the war, the Nigerian government has not relented in abusing our rights. The rigors of war has been with us till date. They still slaughter and maim Biafrans at slightest chances. They never rebuilt our lands. They neglected us and never brought government or developmental structures to Biafra land. No one from the eastern region has been allowed to rule until recently Goodluck Jonathan won the election. They promised to make his tenure unbearable and ungovernable, therefore, they unleashed boko haram terrorists, and schemed him out of office. Now God has determined to release his people by reawakening hope in Biafrans but Buhari abandoned his priority and went after our Moses (Nnamdi Kanu). 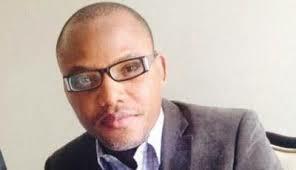 As usual, his sole aim is to oppress the Biafrans and capture our lands and resources. The only missing link for him is that he cannot connect with our resources and land because things have changed. This is 2016, not 1967-70. We are totally fed up. We cannot harbor these invading rogues any more. They hate us but love our lands, what a sham? But their inordinate affection will be met with tough resistance. It is good to die trying and fighting than to wait and be silenced for life. We are the strong hold of Africa. We hold the ace in our hands. Technology, craft, Agriculture, oil, many natural resources abound in our lands, what do we need from a loveless union, and unfruitful marriage? Can two walk together except they agree? Mazi Nnamdi Kanu has lit the flame of hope, will we quench it? NEVER! It does not matter whether he is inside prison or not as his weapon which is truth will never cease to be unleashed upon the fraudulent debris called Nigeria.